1.This machine is four pillar type designs, suitable for make a big size printing area. 2.Because of all the moving parts are soaked in oil, so itself is a good lubricating system, Thus it wears away little, durable and moves smoothly. 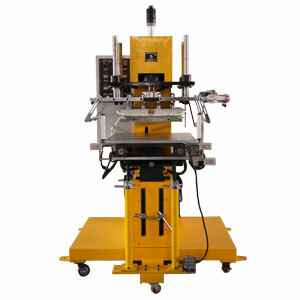 3.It is not like the air pressure stamping machine which is equipped with air compressor to make big noise,. Therefore, it can be operated anytime as necessary without disturb neighbors and causing less output quantity. 4.Foil rolliong design in motor type, the feeding distance of rolling foil is accurate and does not be influenced by the stroke of the main shaft. Suitable to big size of processing article, like clock, frame of TV, frame of radio.